Much has been written about the pros and cons of working in “the cloud”. Even in this Newsletter, if you search under “cloud computing” you will find 26 articles, written over several years! Just to re-cap, the essential concept is that data is stored in an online location which is accessible from an internet-connected device, as opposed to being kept on a local hard drive or portable storage medium. In theory, cloud computing enhances data security as logins are generally required for access, and it’s less susceptible to hard drive failures because of backup procedures. It also improves collaboration opportunities and makes data easier to access from multiple locations and devices. Recent figures indicate that the growing popularity of cloud storage may be a contributing factor in the declining hard drive market in Europe, at least amongst consumers (although the providers of cloud storage still need to purchase large amounts of hard drive space). The omnipresent search engine was one of the first companies to offer cloud storage office services with Google Docs back in 2006, after acquiring Upstartle (which had created the web-based word processing service Writely) and releasing its own web-based spreadsheet program. It later added a presentation service to its suite before rebranding to Google Drive “the new home for Google Docs”. Creating a new document or spreadsheet is straightforward and intuitive using Google’s system, particularly for those familiar with alternative office-type software. Files can easily be shared with others and, depending on the permissions granted, can allow them to view and edit them, accomplishing the collaborative aspect of the product. Instead of sending attachments back and forth like a game of ping-pong, all relevant parties can access files using a link or by logging into their Google Drive account. Although Google Drive is designed to be used whilst online, document editing can take place without an internet connection. As long as Google Drive software has been installed on the relevant device, online and hard-drive versions of the files being worked on will be automatically synchronised. So travelling in the absence of a Wi-Fi signal does not prevent work from continuing – upon re-connection to the internet any changes to documents will be uploaded. Another advantage of Google Drive is that it seamlessly integrates with other office suites such as Microsoft Office and OpenOffice. So, for example, a Word Document can be imported or a spreadsheet can be exported to ODF format, and there are also PDF output options. This versatility allows for the adoption of Google Drive even when colleagues and/or clients are using different office software. At the time of writing, free accounts get 5GB storage which is shared between Google Drive and Picasa (more on this below). Additional storage can be purchased with monthly price plans. You’ll need a Google account in order to use Google Drive. If you use Gmail or any other Google services, you’ll already have an account. If not, you’ll need to register for free. You can then log in to Google Drive and either create a new document or upload an existing document. If you want to share a document with someone, you can use the “Share” button to choose who is allowed to view and/or edit a particular document or set of documents. A link will be generated which you can send to relevant contacts. For example, this article was written using Google Drive and can be viewed there. This particular link can be viewed by anyone who knows the web address. But if you have a confidential document, you can restrict viewing to specific contacts (although they will need to have Google accounts). You can even choose to make the document publicly available and searchable online. The type of access also needs to be configured. The document can be made “view only”, openly editable or editing functions can be restricted to specific individuals. There’s also a “comment only” option. Another successful Google project has been its increasingly popular internet browser, Chrome, which had around a third of the market share in March 2013. The growing uptake of Google Drive and other web-based and cloud services allowed the company to explore a new direction which would give their browser pride of place. 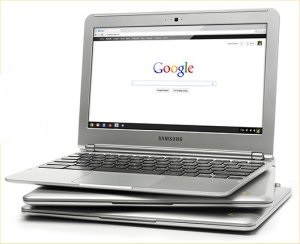 The Chromebook is essentially a laptop which relies almost entirely upon the Chrome browser. There is very little operating system to speak of and programs cannot be installed; essentially it’s just a portable version of Chrome. At first, the concept of a browser-only laptop seems a little strange. But one soon realises that the majority of everyday computing tasks can be done via the web, internet connection allowing. Because the Chromebook only needs to run a web browser it does not require an expensive processor and becomes a very cheap laptop: £199 for the Acer version and £229 for the basic Samsung offering. Both of these machines have 11.6” screens and are very light and portable. There is a slightly more expensive Samsung Chromebook which has built-in 3G and the far more expensive Pixel which boasts a high resolution touch-screen, backlit keyboard and glass touchpad. Aside from the cost benefits of the standard Chromebooks, their simplicity means that they are very fast to start up and require minimal maintenance. Updates to the Chrome OS are automatically installed. Furthermore they have security features built-in, so there’s no need to run separate anti-virus software. Google’s drive towards cloud computing in relation to office applications has already been discussed. However, what about storing media content such as photos, videos and music? It seems that Sergey Brin and Larry Page have these bases covered too. Picasa Web Albums allows photos and videos to be uploaded to their servers, so pictorial memories no longer need to be stored on a local hard drive. Separately, there is stand-alone image viewing and management software with the confusingly similar name of Google Picasa which can be used in conjunction with Picasa Web Albums. However, space is limited to the 5GB for a free account which is shared with Google Drive. So in the case of large numbers of high-res pictures or videos, extra storage will need to be purchased. Alternatively, videos can be uploaded to YouTube – also owned by Google – which can be used as extra storage space (the videos can be made private). Even MP3 collections can be stored on Google’s cloud, using Google Play Music. This allows up to 20,000 songs to be uploaded for free, and also provides a music shop where additional content can be bought. The numerous Google offerings which have been discussed in this article provide evidence that we are heading towards a new way of working with office software and digital media in general. Instead of sending files to and fro via attachments, we can now work with colleagues and clients collaboratively using Google Drive. Rather than storing pictures, videos and music on local hard drives, we can simply upload to Google’s servers (Picasa Web Albums, YouTube and Google Play Music) and enjoy sharing, listening and watching online. The Chromebook provides a tool for taking full advantage of this emerging Google ecosystem, as people increasingly choose to move various aspects of their lives to Google’s cloud.